Despite some indications of declining interest from consumers, these gun models are still proving to be popular with gun buyers. It's been said that America loves its guns. To be sure, millions of handguns, rifles, and shotguns are sold domestically every year. Exactly what guns Americans are buying, however, is much harder to know. While federal law requires firearm dealers to record gun transactions, it bars that data from being compiled and stored in a central repository. In place of sales data, financial analysts can use the total number of background checks to gauge interest in firearms -- but that data offers no way of determining what guns are being purchased, and offers only limited insight into repeat buyers. Individual companies also offer few details on unit sales. SIG Sauer's hot-selling P365 Nitron Micro-Compact. Image source: SIG Sauer. Here's what we do know: Handguns are the most widely-produced type of firearm, representing about 40% of total firearms manufactured in 2016, the most recent year for which the Bureau of Alcohol, Tobacco, Firearms and Explosives has data. Handguns also represent more than 70% of total firearms imported into the United States. Absent any official tallies, I turned to GunBroker.com, the world's largest online auction site for firearms, which tracks and publishes monthly best sellers on its Gun Genius site. Gun Genius lists the leaders in every major category, but following the lead of my colleague Rich Duprey, I focused on new, semi-automatic handguns. I compiled the top five for the first 11 months of the year, and tallied them based on a rough scoring system. Thirteen different models made the list this year. Here are the top five finishers. The LCP, which stands for "lightweight compact pistol," has been a top seller since its introduction in 2008, thanks to its compact design and affordable price. This handgun finished in the top spot in both 2016 and 2017, and continues to sell well despite newer competition. This is the only entry from Sturm, Ruger & Co. (NYSE:RGR) to make the top five. Company execs on a November call with investors said it is a buyer's market, with CEO Chris Killoy stating: "If you go to the counter at any of the big box stores, you will see plenty of rebate counter cards out there with the tear-off coupons from a lot of our competitors." Ruger, he said, does not discount as aggressively at the consumer level. Sturm, Ruger shares are down 12% since the company reported third quarter results on Oct. 31 that missed on both earnings and revenue. However, the shares have actually outperformed both the S&P 500 and rival American Outdoor Brands (NASDAQ:AOBC) over the past year. RGR and AOBC vs. S&P 500, data by YCharts. The P320, called the M17 in Army parlance, was chosen in 2017 to be the new standard issue U.S. Army pistol. The civilian version is quite popular as well, with its polymer build and a striker-based firing system that leaves fewer parts exposed. The P320 returns to this list for the second straight year despite a choppy history. Last fall, numerous videos surfaced warning that the firearm could accidentally discharge when dropped at a certain angle. The company issued a free upgraded part to correct the problem, and consumers seemingly have not shied away from buying the weapon in the months since. The original SIG Sauer was a Swiss-German partnership, but the company that produces these firearms today is privately-held SIG Sauer Inc. of New Hampshire. The Shield builds off of Smith & Wesson's well-regarded line of full-powered M&P pistols to create a more compact, lightweight version designed for personal protection. Smith & Wesson is owned by American Outdoor Brands, the other major publicly-traded U.S. firearms manufacturer. 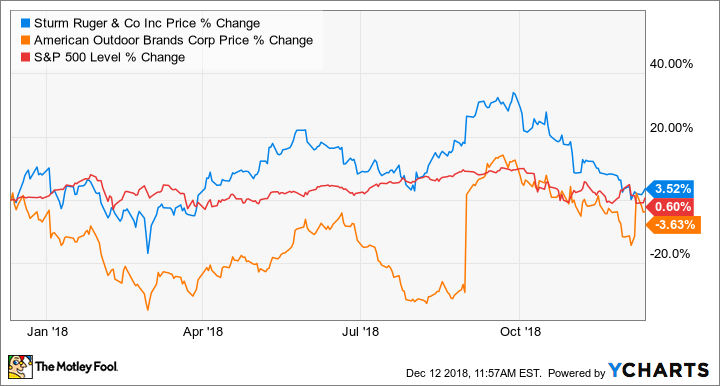 American Outdoor Brands shares have had a rocky year, but have been gaining strength since the company reported fiscal second quarter GAAP earnings and revenue that exceeded expectations on Dec. 6. On a call with analysts following the earnings report, CEO James Debney said American Outdoor Brands is gaining market share, noting that while handgun background checks in the quarter declined 8.8% year over year, the company's units shipped to distributors and retailers fell by just 1.9%. American Outdoor Brands is also in the process of moving to a new distribution facility in Missouri that should eventually reduce operating costs. The PMR-30 is another holdover from last year's list, moving up from a fifth-place tie. The 30-round, .22 magnum semi-automatic continues to be popular thanks to its light weight, low recoil, and reputation for durability. Privately-held Kel-Tec CNC Industries of Florida introduced the pistol to considerable fanfare in 2010, and added a rifle derivative, the CMR-30, in 2016. Kel-Tec used a combination of polymer and aluminum fittings around steel components to reduce the PMR-30's overall weight and make it easier for smaller hands to grip. The company also uses a European-style magazine release at the heel of the pistol rather than up by the trigger guard, which has proven popular with reviewers and consumers. This compact pistol, billed as "the ultimate concealed carry pistol," was the runaway winner, entering the Gun Genius rankings in March in the top spot and remaining in that position for the entire year. As the name implies, this weapon has a compact design ideal for everyday handling, but it carries a powerful punch. The P365 fits 10 rounds in its miniature magazine, more than most compact handguns. SIG Sauer engineered this firearm from the ground up with the specific goal of coming in shorter, lighter, and thinner than almost anything in its class, which might explain the weapon's widespread popularity. If there is a conclusion to be drawn from this list, it is that compact and lightweight guns designed for the personal-protection buyer are the most popular. The industry knows this, and each company in the field is constantly looking to one-up the others with new design innovations. Expect another shootout in 2019.